There will be butterflies flitting about at the upcoming HDExpo 2013 in Las Vegas, Nevada next month. Well, maybe not flitting about but there will certainly be butterflies in the Martin Pierce Custom Hardware booth #2153. Why? Because we are offering our magical small butterfly drawer pull to the first ten lucky visitors to our booth. 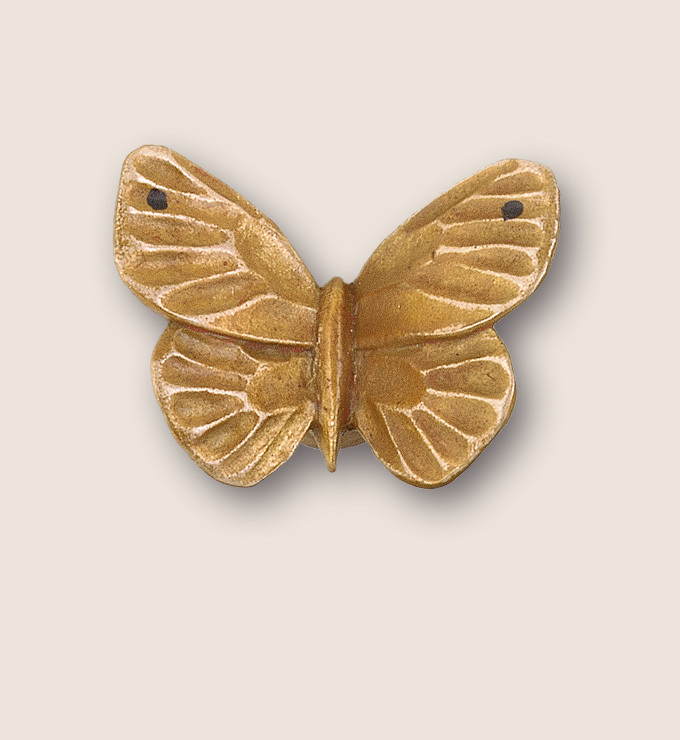 You can add this pull to your desk drawer to brighten your day each morning, install it on the bathroom vanity for a touch of nature or delight any little girl with butterflies in her bedroom. Used as a decorative accent on a bookshelf, coffee table display or desktop it is certain to add a smile to your face. This drawer pull is hand-crafted in the same manner as all of our hardware pieces; beginning with a drawing by Martin used as a template for the hand-carved wax mold, cast in bronze and polished to the perfect patina. A true miniature work of art! We look forward to seeing old friends and making new friends at the Expo so be sure to stop by and say hello–and make it early, remember, there are only 10 of these butterfly drawer pulls to go around. This entry was posted in Uncategorized and tagged bronze hardware, custom hardware, drawer pulls, hand-crafted art, hand-crafted drawer pull, HD Expo, miniature work of art. Bookmark the permalink.